Septuagint Scholar Interview: John A. L. Lee | Septuaginta &c.
I was fascinated by Greek from about the age of 12, and began studying it as a subject at secondary school in Sydney, my home town. I continued with it at the University of Sydney in what was then a Department of Greek (i.e., ancient [or classical] Greek). I don’t think I was even aware of the Septuagint until it came up in reading Hebrew in a Department of Semitic Studies. I took up Hebrew at undergraduate level for no other reason than that it looked interesting and I liked languages. I then took formal courses in both Greek and Hebrew to the end of my degree (BA Hons 1966). I first saw the LXX mentioned (predictably) as evidence in relation to the Hebrew text. Soon I began to get interested in it for its own sake, and by the time of my final (honours) year in Hebrew I did a ‘thesis,’ or long research essay, on the LXX of Jeremiah, comparing the Greek with the Hebrew. As I can see now, it was a study of translation technique; and it was a beginner’s effort, uninformed by the debates about translation method or even the basics of textual criticism. What training did I have? In the discipline of LXX studies as such, none. There was no one among my teachers who was qualified or trained in the LXX, though one, Frith Lambert, did her best to guide my interests. But the training I had in the languages, that is, Classical Greek and Biblical Hebrew, was an ideal preparation. I had the languages; as to the rest, I had to find my own way. I was not the product of any ‘school,’ or steered into a particular LXX subject-area by another’s interests. This was not necessarily a disadvantage: it left me free to pursue my own track, and the outcome was satisfactory. But I would say now that guidance from an experienced scholar is desirable in any study of the LXX. An important element in my early training was my introduction to Koine Greek in a course offered by G. P. Shipp, then Professor of Greek. We read Greek papyri and some NT, the focus being on the development of the language. The LXX was not included, but this course led me to see a connexion between the LXX and the Koine Greek of its time, and to think of a possible line of research combining the two. So it happened that when I went to Cambridge, England, to study for a doctorate, I already had a subject in mind, though it took time to develop into a suitable doctoral thesis. Even in Cambridge, though it had been a centre of LXX studies at one time, there was little guidance to be had on the LXX, and especially not on the approach that I wanted to take. No one was quite sure what I was ‘on about.’ The best help came from a lexicographer, John Chadwick, who was not even my formal supervisor. The association was opportune, because I came to realise that lexicography was fundamental to work on the LXX vocabulary and that I needed to sharpen my skills. 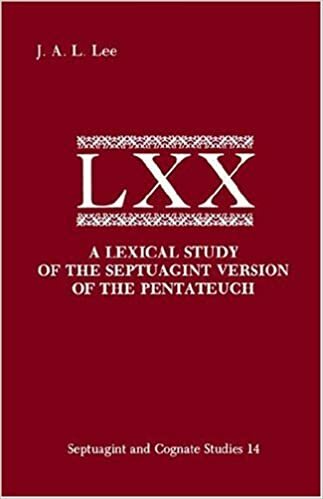 My doctoral dissertation, completed in 1970, was eventually published in 1983 as A Lexical Study of the Septuagint Version of the Pentateuch. Today it is routine for budding academics to publish their dissertation as soon as possible, and mentors strongly advise it. It was a different world then. In due course its contribution was recognised, although of course it had limitations (of which I have written elsewhere). I made no other major contribution to the LXX for many years, though there were a number of articles. My interests had turned to the Greek of the NT. In particular I became involved in a project to produce a new Moulton and Milligan. The aim was not very different in nature from my work on the LXX: the purpose of both was to gather evidence connecting the Greek of the biblical texts with the language of their time. This difficult project was unfortunately never completed, despite 20 years of work. It did lead me to a closer study of NT lexicons and the problems in NT lexicography, which resulted in my A History of NT Lexicography (2003). After finishing the book on NT lexicography I had again turned elsewhere, to the Complutensian Polyglot, especially the NT lexicon printed as part of it. This led on and on in new directions (see, e.g., NovT 47 (2005), 250–90 on the ‘monotonic’ accents of the NT text), and there is much more waiting to be done. An invitation to give the Grinfield Lectures in Oxford brought me back to full engagement with the LXX. It was a chance to think again about the ‘unfinished business’ of my doctoral dissertation. 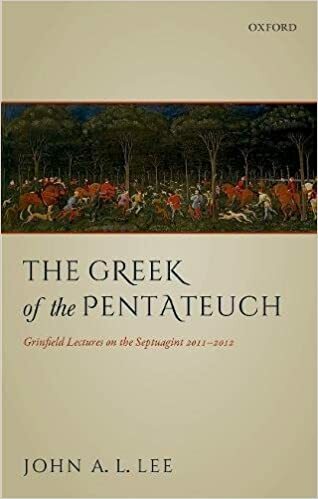 The result is a book soon to be published, The Greek of the Pentateuch: Grinfield Lectures on the Septuagint 2011–2012 (OUP, 2018). In 2012 I also gave the Jeremie Septuagint Lecture in Cambridge, a pleasing symmetry: I had won the Prize of the same name some 44 years earlier. Among lesser publications on the LXX I would like to highlight my review of Muraoka’s Lexicon (BIOSCS 43 , 115–25), which is not only a review but offers a clarification of the two approaches to determining meaning that lie behind NETS (and its often misunderstood ‘interlinear’ model) and Muraoka’s Lexicon. I take this as referring to how LXX studies were part of my teaching as a full-time academic. My post was in a Department of Greek, the same one in which I had done my BA. The subject-area was ancient Greek and we all took part in courses in that area, reading Classical authors and taking unseen translation classes and so on. One’s training in Greek simply went on and on—for the next 30 years or so. A specialism in Greek language was not discouraged, however; in fact it was expected to be part of the course offerings. It might be thought that the LXX could hardly find a place in this framework. 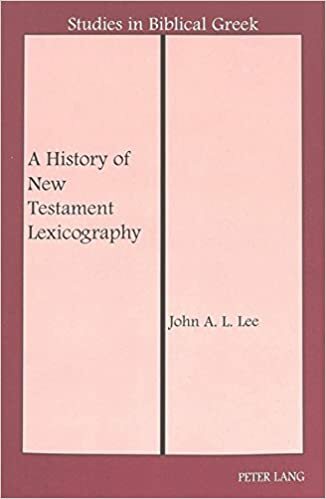 But over the years (from 1973 to my retirement in 2001) I was able to include reading of the LXX in a number of places, notably in a Koine Greek course (similar to Shipp’s course in 1964), which incorporated papyri and inscriptions, the NT, and—as a specimen of Koine Greek—the LXX. In some years I offered a course of reading in the LXX for the MTh or BD, or for honours in Hebrew, outside our department. It was also possible for a higher degree in the LXX to be supervised within our department, provided it involved full engagement with the Greek language. Apart from one or two at Master’s level, my most notable candidate was Trevor Evans, who completed his PhD in 1997 and is now a well-known scholar in the field. All this was rather unusual for a Department of Greek and depended on the presence of one staff member whose interests happened to include the LXX. One could reflect further on the precarious position of LXX studies in the present frameworks and marvel that they have flourished so well around the world in recent times. The obvious thing is expansion. The growth in interest and activity since I began in the field in 1966 has been astonishing. Work seems to be going on in every corner of the subject, not just traditional objectives such as the establishment of the text. The rate of publication on all aspects of the LXX has grown enormously and shows no sign of slackening. There has also been the founding of IOSCS, which did not exist when I first began; we have a journal of our own; and conferences and special seminars proliferate. This expansion was partly, or even largely, due to the arrival of computers and electronic resources. This was truly a revolution. It gave us not only computers to work with, but electronic tools for doing all sorts of searching tasks with ease and speed. Another thing that has changed is the ease of contact with scholars around the world. In the northern hemisphere it may always have been felt that colleagues were not far away and could easily be contacted. In Australia, up till about 1990, it was much harder and one did have a sense of isolation. It is not only email contact that has changed things, but ease of flying (though it is still a long trip). 5) Do you see any topics that receive too much attention or approaches that are unhelpful? (a) Uncritical reliance on older statements and generalisations, such as Thackeray’s characterisation of the LXX books (in part). (b) Electronic dissemination of obsolete works, such as Conybeare and Stock’s Grammar. (a) Training for study of the LXX, especially training in reading Koine Greek (by which I do not mean the NT) and Classical Greek. (b) Practice in reading documentary texts (papyri and inscriptions), and acquaintance with the tools to access them. (c) Action to ensure accuracy in the electronic tools. In the program I am using (no names) there are errors in the Greek text and many tagging errors. We need speedy action, so that the mistakes do not persist and spread. (d) A sense of advance in the subject. Some topics seem to attract repeated attention with little new being said, while summaries of past work may repeat old views without re-evaluating them in the light of recent evidence or discussion. My main work in the LXX field now is a study of the infinitive in the Pentateuch, with special attention to verbal aspect. I am also working with Trevor Evans on a project to create a Greek-English Lexicon of the Zenon Archive project (GELZA). Though not directly focused on the LXX, this work will be highly relevant to it, especially the contemporary Pentateuch. It will be a guide to the vocabulary of a large portion of Egyptian papyri of the third century BC. 7) What are the most important tasks for the discipline in the future? (a) A corrected edition of NETS. This important tool was a great advance and there is no question of its value. But minor errors are detectable, and a concerted effort should be made (but not in a hurry) to collect necessary changes and incorporate them in a new edition. I know this is going on already and electronic updates are available, but the printed work is the one most people use. (b) Corrections to Muraoka’s lexicon. This standard tool will be used for a long time to come, but improvements are needed. A collection of these should be assembled over time, ready for a new edition. (c) The gathering of parallels to the LXX vocabulary from non-LXX sources, especially documentary sources. In time this will supply data relevant to (b). (d) A short syntax of the LXX. We now have Muraoka’s Syntax (2016), but it is early to assess the value of this work. Whatever the verdict, a shorter syntax is a desideratum. Above all, we need to replace (and forget) Conybeare and Stock. (e) A smaller Thackeray also would not go amiss, that is, a guide to the phonology and morphology of the LXX based on Thackeray’s Grammar, but updated and reduced in detail. A target audience with limited Greek needs to be considered. (f) A database of the bibliography on each word in the LXX vocabulary. This exists to some extent already in RBLG, but we need a new electronic tool with focus on the LXX, one that can be maintained and updated indefinitely.